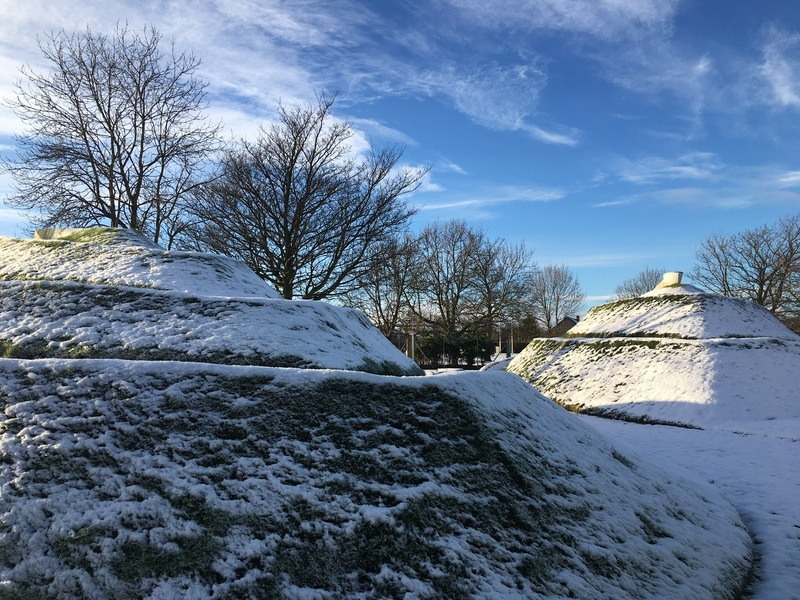 These are some snow shots of the beautiful and inspiring centre which I have moved north for. Set in the heart of historic Inverness, the capital of the Scottish Highlands, they make a bold and challenging statement in the grounds of Raigmore Hospital. 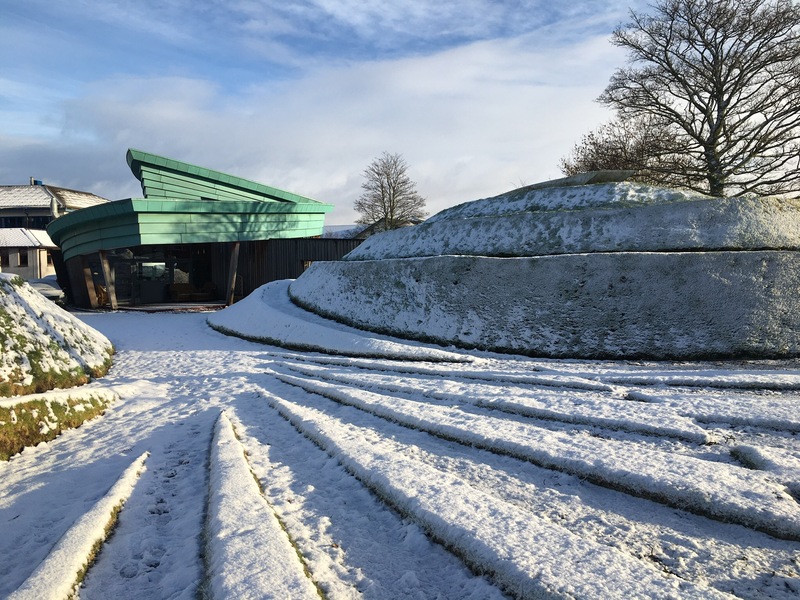 Inspired by the shape of diving cells, the earth mounds and the copper building offer a truely inspiring place to creatively support families living in the Highlands and Islands of Scotland who are dealing with cancer. Last Thursday under the full Wolf Moon, a hare lead me out between the mounds into the glittering snow, and the hushed air. All was timeless and still between the raised earth coils, and only the moon saw as I walked the path of the hare, on into the darkness….. The wonderful landscape and architecture create an ever shifting magical ambiance…..which fits beautifully with this weeks WordPress Weekly Challenge. 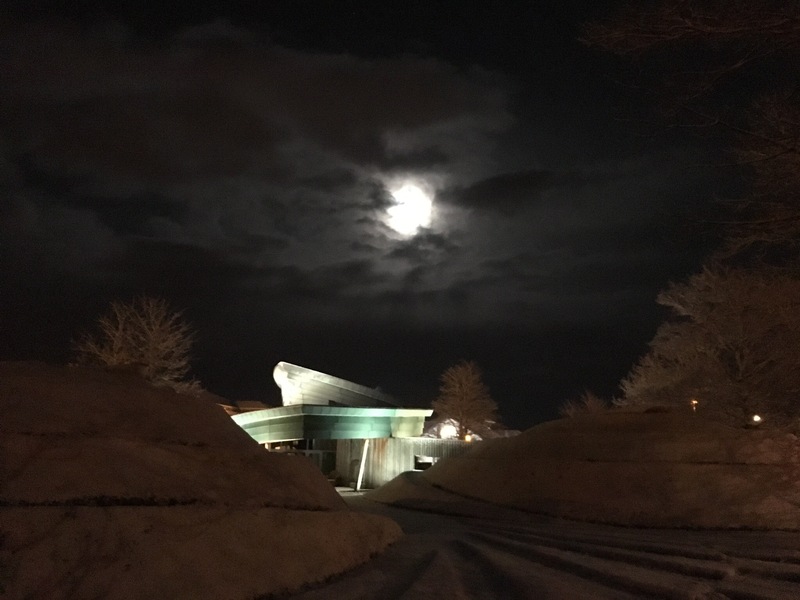 This entry was posted in art, elemental, nature photo and tagged cancer, earth, full moon, Inverness, landscape, Maggies, magic, night, photography, scotland, snow, winter. Bookmark the permalink. Sounds so beautiful its almost fairy tale. Lovely to think you’ve made the Edinburgh to Inverness move too! I hope you’re settling into Highland life and your new role. If you fancy connecting with other photographers up here, have a think about coming along to Inverness Camera Club when it starts up again in September. I’ve made some good friends there and have enjoyed many of the guest speakers. Eerily beautiful, that last shot, Seonaid. It’s a stunner 🙂 Superb surroundings to carry on your important work. I hope you’ll be fulfilled and happy there. It was a rather special evening, and the centre always has some new atmosphere to share.Its a beautiful place to work. Yours is a truly beautiful country Seonaid – we so enjoyed our visit and managed to put 1200 miles on our rental car – quite a feat we thought!! Congrats on the new position, you will do doubt bring kindness and care to a new level in an already amazing place. Looking forward to more news of your new surroundings. Congrats, really,! -and looking forward to new wonderful posts! All the best with everything new. Enjoy. Many thanks, delighted to hear that. A new base from which you can continue your adventures. Blessings. What a lovely comment, and yes it feels that there are many new adventures waiting in the wings! Good luck in your new job, you must feel really privileged to work in such a stunning setting. Well done Seonaid! Oh fabulous! That’s such inspiring design. Having spent way too much time in hospitals myself as a patient I can tell you that the grounds and feel of the building make a big impact on the wellbeing of inpatients! I hope the centre is proactive in encouraging patients to spend time outdoors. Too many keep people stuck inside like prisoners! Fresh air and calming surroundings are so beneficial. Congratulations on the new job 🙂 I hope you find lots to love about the area around Inverness!! I hope so too Sarah….and yes lots of interaction with nature is encouraged. The mounds each have a spiral path which leads around to the top, where a white snake forms a perfect place to sit! We have a therapeutic gardener who takes weekly groups, a walking group….and other classes like art therapy, creative writing and yoga who regularly use the outside space. Sarah, that sounds like some truly awful hospital experiences. I can’t even begin to imagine speaking to a patient in that way. Maggies Centres have been showing the way forward for 20 years now, and I’ve been lucky enough to be at the cutting edge for 14 of those years, down in Edinburgh in the very 1st centre we opened. Thankfully things are improving and hopefully our way of working influences not just cancer care, but as you highlight, the care offered for all chronic illnesses. I know that the Maggies Centre in Aberdeen has provoked the hospital to build fabulous design and links with nature into the redesign of both its new oncology unit and its family and reproductive medicine unit!! It’s appalling the way so many patients are treated at general hospitals 😦 A little compassion can go a long way! Maggies has a well deserved reputation and the kind of work done there definitely filters through to some centres 🙂 It’s a tough time within the NHS and social care at the moment! I think the only reason that some centres are able to flourish is the financial support from charitable donations and fundraising. The music event I recently blogged about had raised enough money to get our local oncology ward a mobile powered hoist! It’s going to make such a difference for staff and patients. I just don’t think they should have to rely on charity for such things! They should be available on every ward in every hospital. Bless you for the work you do, as rewarding as such a position can be it’s also one that can be very stressful and draining. You make a difference to people when it matters the most! Congratulations on your new adventure! Many thanks John….another page to turn!! It’s true, and it does….on a fairly regular basis!! Have you got a new job? Congrats! And what lovely shots – very mysterious indeed. I hope to share some new adventures, but at the moment the transition is lots of work!! I wish you well in your new job and location. It looks like a very healing place. I hope you find your time there rewarding. It sounds like you have moved to another area of Scotland, or just the job, and not your home. I take my hat off to you in helping children and families with cancer. Also, CONGRATULATIONS on the new position. I’m sure you will be GREAT! The hospital looks like a lovely place. We’re in the process of moving Gwynn, from Edinburgh to Inverness. It’s such a beautiful area up here, and the Maggies Centre is a stunning building to work from. A very exciting year of change ahead!